Aside from loving all of your reviews, just wanted to finally say thanks, because there's no one on Twitter except for you who basically forces me to click the link on every post. Hat tip, sir. Keep up the excellent work. Brock: Well, thank you very much! I certainly appreciate that, just as I appreciate you following along (and I'm glad you're enjoying them). Take care, and thanks also for taking the time to post the comment! This flick is just awesome. I loved almost every single second of it and it's one of those rare flicks where I just wanted to see them talking. The sequel is even better and from what I hear, the third one is already being filmed. Cannot wait! Good review as always Dave. @dtmmr: Thanks for stopping by once again! And I'm in complete agreement with you. You read the synopsis for this movie, and it probably won't sound very interesting at all, but the conversations are so engaging that you get complete wrapped up in every exchange. The 2nd one was a solid film, and I, too, am looking forward to the 3rd entry. I can honestly say I don't think I've seen this one. 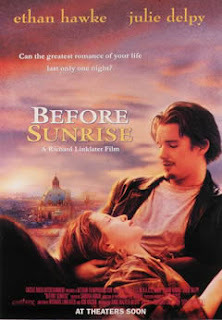 In preparation for the opening of Before Midnight, I am again watching both Before Sunrise and Sunset. Somehow, I enjoyed Sunrise even more the second time. I was even more blown away by the amazing actors and the engaging dialogue that allows us to be both watchers and in the middle of their burgeoning love. I shall watch Sunset later. Both in one day is a bit too much. Thanks for your review. All 3 films are great quote unquote chick flicks!Ethan Hawke & Julie Delpy spark as a charming couple! Director/Co-Writer Richard Linklater note Julie was also co-writer have fashioned a truly underrated tri-picture that should be must see!